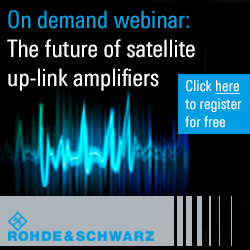 ...an industry leading remote recording service for satellite reception devices. 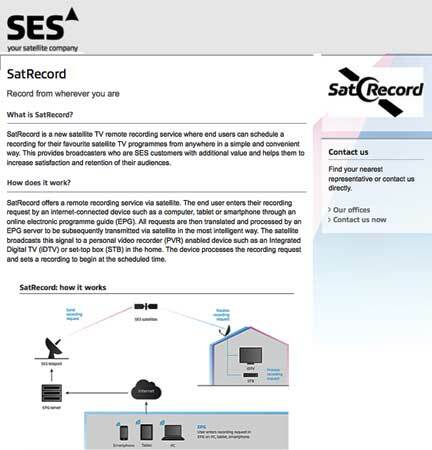 SatRecord is a new satellite-based TV remote recording service which will provide consumers with the flexibility of recording their favorite TV program via Internet-connected devices, such as PCs, laptops, tablets or smartphones from wherever they may be. Consumers will enter a request to record TV programs using their PCs, laptops, tablets or smartphones via an EPG (electronic programming guide). The request is then sent over-the-air directly to their STB that has been enabled for SatRecord service. Visitors of the SES stand (Hall 1, Stand 1.B51) at IBC in Amsterdam will be able to see prototype devices of SatRecord-enabled PVRs and record TV programmes via satellite. SatRecord will become available on the first satellite receivers in Germany in 2013 and will be offered later in specific European countries.